Home page: Log on to MarketingSherpa for your research fix. Most computer games are kinetic and forward-moving by nature, and don’t give the player enough time or motivation to stop and stare, look and notice or sit back and think. The genre of the “adventure game", featuring masterpieces such as Funcom’s The Longest Journey or LucasArt’s Monkey Island series, tried this and met with uneven success. Where, then, is the gaming equivalent of a meditative experience? The answer is up there, in the clouds of the Internet, in the smiling, beatific faces of online flash games. And not just any flash games, mind — we’re talking about the Room Escape. Room Escapes are a particularly odd breed of flash games: They’re calm and slow, and often unintrusive. Most are set in a single room, and end as soon as you find a way out. Some games use this basic structure to weave wonderful narratives and set pieces — a nuclear war survivor trying to leave his shelter, or an astronaut stuck in a seemingly desolate spaceship. Most exude a wonderful sense of atmosphere, and attempt to bring alive the time period or setting in which they’re based. Usually, the focus is solely on solving puzzles. Some favour an unsavoury variety of them called “pixel hunts", requiring the player to examine every speck of dust on every wall to move forward. They’re gaming equivalents of an art film — beautiful artwork and imagery, but where are the explosions? In most cases you start in...well, a room. Sometimes, there’s a bit of exposition, a bit of backstory explaining how you got to the room. But usually, you’re just there, and just a few clicks away is the exit, usually locked or closed or barred or hermetically sealed. You move around by clicking at the edges of each screen; click on objects of interest to examine them or take a closer look. Some things you can pick up; These are then added to a bar on the bottom or top, your “inventory", so to speak. Double-click on an object in your inventory, and you can take a closer look at it. Figuring out how to use these objects is a common puzzle tactic. Putting a chunk of metal on a wooden bar with a bit of glue, for example, makes a rudimentary hammer. Usually, the protagonist is silent, but there are room escapes with distinct characters. Other characters are rare and, even if present, usually have to be either rescued or woken up. The quality of puzzles ranges from the childishly simple to the fiendishly impossible. If you reach that point where you start combining everything you have with everything in the game, stop. Take a deep breath. Look at the locations carefully, examine everything, make sure whatever can be fiddled around with has been. Pay attention to visual cues. Always search for hidden spots — little gaps between the furniture, the space behind the strange gizmo. 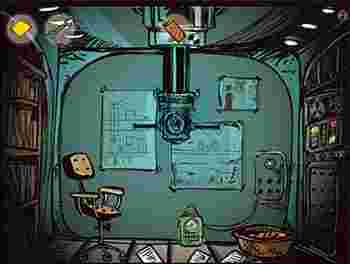 Stunning, hand-drawn visuals, mechanical contraptions, excellent Cold War atmosphere and a few fiendish puzzles. A strange, oddly intriguing narrative, puzzles of the “make notes, lose sleep over solving complex codes" variety and blue aliens! A blend of survival horror and traditional Room Escape mechanics. A rumbling, edgy plot, some genuine scares and a wonderful sense of atmosphere.